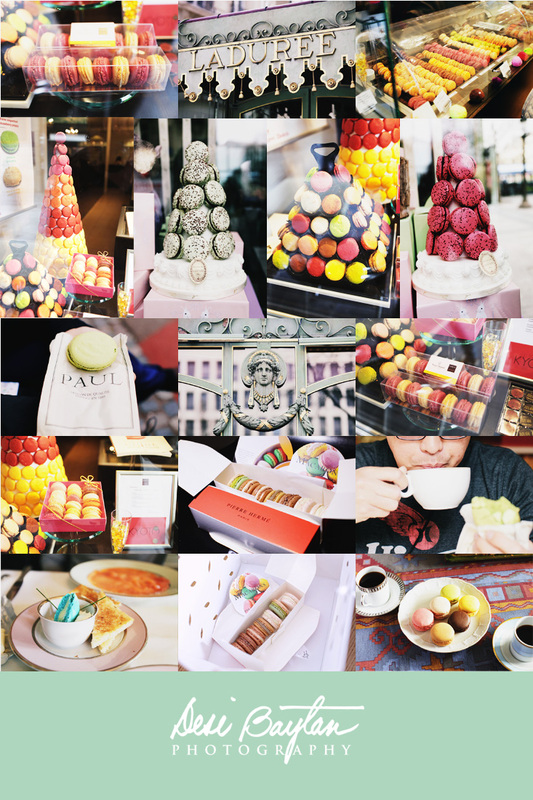 Coffee with Hermé, Darcis, Paul and Laduree – macarons that is. Macarons are one of my favorite desserts. They make wonderful wedding favors and photograph beautifully because of their cute round shape and vibrant colors. So, while traveling Europe, we sought out macaron stores to have a little taste test. You would find macarons among other desserts in many patisseries. The notable macaron shops we saw are Pierre Hermé, Laduree and Jean-Philippe Darcis. You would see assortments of macarons up to 12 different flavors, and colors nestled next to gourmet chocolates. We also found them in gourmet markets like the Le Bon Marche in Paris. What should a good macaron taste like? First and foremost it should have a light and fluffy texture; when you bite into one, there should be little resistance but pure soft and puffy consistency. Like biting into a cloud. The filling should not be too sweet. Contrasting flavors such as a tart filling against the sweet cookie outside will have you beg for more. Out of all that I tried, I have to say Pierre Hermé makes the best tasting! For us living in the states, worry not, we have a few specialty stores that make macarons, just as tasty as the European counterparts. Joie Patisserie, for one, is my favorite!